As we come into the middle of the month, with the big C only 2 weeks away, it’s important to stay focused on what’s important. It’s easy to get caught up in the hustle and bustle around you, which distracts you from what’s important to you. It’s not only this time of year that we can be easily distracted. Those of us with children at home, or who live with other people can be drawn into things which are taking us away from our goals.With 3 weeks left of the current year, you may still be working towards achieving goals, both personally and in your business. One of my Business Cheerleading Club members is working hard to achieve her goal of running 1000 miles this year. She had an injury earlier in the year, and is so close to it I believe she’ll do it. She’s focused on the excitement of winning. 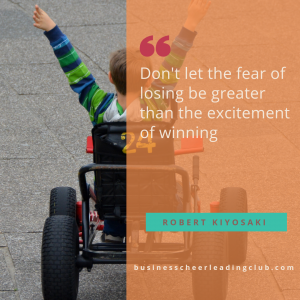 What are you excited about winning? What are you excited about winning this week, or this month? If nothing springs to mind straight away can I suggest you stop whizzing around and work out what’s important to you? That stopping and listening to yourself will set your mind at ease and you’ll realise that you can still win in many parts of your life in the next few weeks, as well as be part of the busy festive season. It’s easy to think that “after Christmas”, or “in the New Year” mindset will help us achieve our long term goals. I’ve had this conversation with some of the clients I’ve been working with recently. I asked them, “so you’re putting your business on hold for the next month whilst you “deal” with Christmas?” They weren’t happy with me to start with, but then got the clarity that it is there choice if they want to do that. It’s not for me to say if it’s right for you to leave your business thinking until 28th December, or whenever you’re back at work as there’s so much else going on. What they worked out, was that they could choose how to divide their time. It’s the same time as you get every other month of the year. You may choose to fit more things in this month, but that’s OK. It’s your choice. 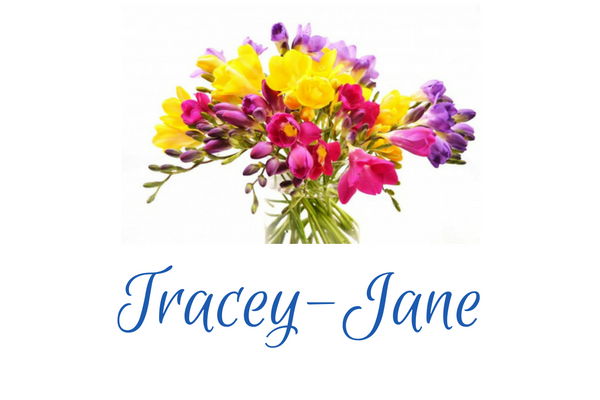 When you’re running a business you can choose how and when you work. How many hours you do and what you do in those hours. Sometimes we spend more time than is sensible procrastinating and not actually doing anything, and I often find that at busy times of the year we tend to procrastinate more! Whatever you’re doing this week, or planning for the rest of the month, make sure you’re clear what’s important. That helps your mind to focus and you won’t be procrastinating as you’ll know what’s important to get done. 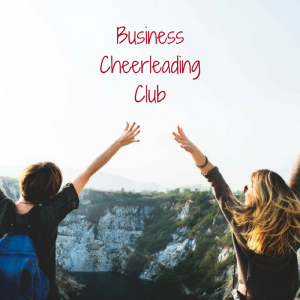 In the Business Cheerleading Club this month we’re focusing on planning. If your mind is distracted with festivities, it’s a good way of focusing on what’ll be important once the festive season is over. You’re welcome to join the Planning Workshop this week which I’m leading. Next week is our monthly Action Spotlight Group Coaching session, so another opportunity to get face to face support for your ideas, plans and issues. Oh, and my 291 page 13 week planner has just been published. It’s perfect for helping you stay focused on what’s important right now in your busy life. There’s still time to order it to get it in time for Christmas. You could give one as a gift to someone else who needs support in staying focused in their busy life. If you’re not currently a member, I’ve opened a festive Giveaway for 2 people to join the club for 3 months, plus 2 x 20 minute one to one sessions. I know some people doing the Get your website working course have already entered to try and get some extra help with their websites! If you’re already a member, if you’re a winner, you’ll win a 3 month upgrade to your membership, so you’ll get even more focused support to get 2019 off to a fantastic start. What are you excited about winning these next few weeks? Interesting post TJ, the thought of making change or implementing plans NOW is what makes me love business so much, being able to implement those plans to your own agenda and timeline i think is one of the most empowering things you can do in business. For this month my goals are clear, finish off our client work, launch a brand new webinar and some ‘secret projects’ yet to be announced.